Budford 1.0.112 is released. Cemu is a great emulator. But it currently only has limited support for per game settings. How many times have you turned on multi-core support for Breath of the Wild then forgotten to set it back to single core before playing Mario Kart with your friends. And we all know how frustring it can be when a new release arrives and your favorite game no longer works. 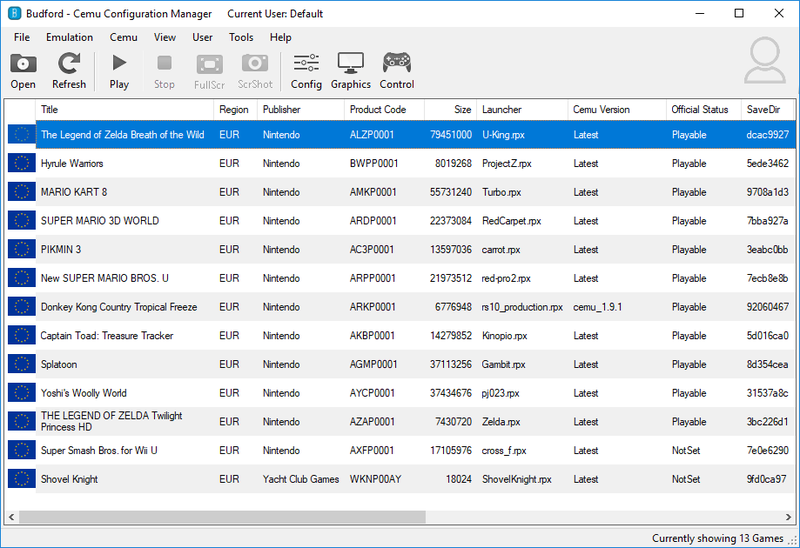 Budford is a configuration management tool for Cemu with a familiar interface for those who have used the Dophin emulator. Budford is not a game launcher, it is designed to work with your favorite game launcher. * Simple user interface for configuring per game settings. * Budford can support multiple users each with their own save file for each game. * Supports multiple concurrent versions of Cemu. Budford will create a symbolic link to your mlc01\usr\title folder. * Can download the latest version of Cemu , Cemu hook and performs all the required setup for you. * Can automatically download the latest graphic packs. * Budford can integrate with your favorite game launcher such as launch box or emulation station, it can even launch straight into the game pad view so you'll never need your keyboard again. * Game ratings and view filters to help you find your favorite games. * Track statistics such as the number of times you have played each game or how long since you last played it. * Easy access short cuts to important Cemu folders such as Shader Cache, Save Folders and Game files. No more searching through log files to find folder names.